With wonderfully engaged movement and beautiful expressiveness, this extremely charming youngster has potential for the big arenas. 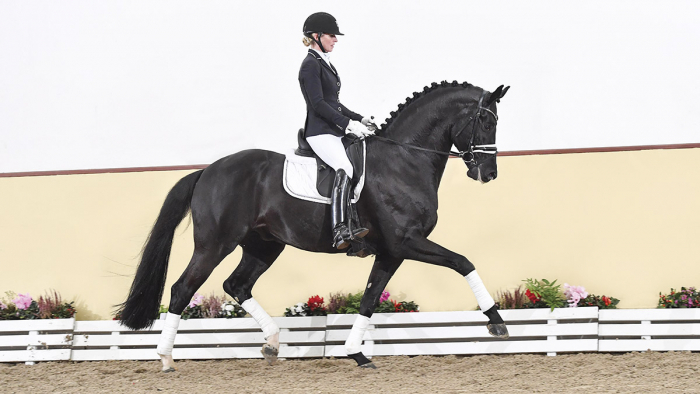 In 2018, Donier finished his stallion performance test in Schlieckau in the top group, with expected high scores for basic gaits, willingness to perform and overall impression (9.0 each). His sire De Niro, successful at Grand Prix level at the age of eight and, among other successes, winner of the Dressage Derby in Hamburg with riding master Dolf-Dietram Keller, has now led the WBFSH ranking list of the best dressage sires worldwide for six years. Our licensed young star Prince Toto (by Fürstenball) is also out of the dam Thery. Dam sire Totilas won double gold at the European Championships in Windsor/GBR in 2009 and triple gold at the World Equestrian Games in Lexington/USA in 2010. From the famous bloodline of Finnländerin descend many stallions, including Blue Hors Don Schufro/Andreas Helgstrand/DEN, Olympic bronze medal with the Danish team. Donier is stationed at Deckstation Paul Schockemöhle in Mühlen.